In November of 2013, Holt Renfrew announced that in 2017 it would be merging its Montreal operations with Ogilvy -- a partnership which would result in Ogilvy expanding while the nearby Sherbrooke Street Holt Renfrew store would close. 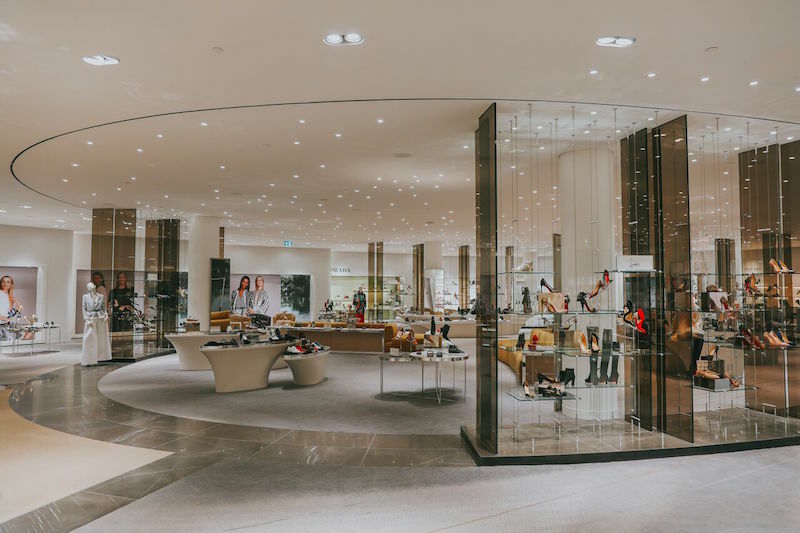 Holt Renfrew has now announced that the expanded flagship will open in 2020, and has revealed some of what will be contained within what will become the company’s largest store. ‘Holt Renfrew Ogilvy’ will become the name of the new 250,000 square foot luxury retail superstore — the largest of its kind in Canada, by far. An expansion is currently underway at the 1307 Sainte-Catherine Street West Ogilvy flagship in anticipation of the opening, will include an adjacent Four Seasons Hotel and private residences on the site of the former Hotel de la Montagne. The new Four Seasons Hotel will include 163 hotel rooms priced from $600 per night, as well as 18 of the city’s most expensive condominium apartments, priced between $4 million and $20 million, averaging about $1,500 per square foot. Holt Renfrew has revealed some of what will be in store for the new Hot Renfrew Ogilvy, and luxury will be key. Personal shopping will be an important component to the store, with the addition of ‘The Apartment’ private shopping suite, as well as extensive personal shopping services. There will be a concierge, valet parking, and a Holt’s Café — services will be “tailored to the Montreal market,” according to Holt’s. The current Ogilvy building will see a reconfiguration of its departments as part of the expansion. The store’s beauty hall will be moved into the basement into a 23,000 square foot space — Holt’s recently did this with its Vancouver flagship, and sources say that the Toronto Bloor Street Holt’s will also see its beauty department relocated downstairs, as Holt’s devotes ample space on the ground floor of its downtown flagships to leased departments for the world's most popular and expensive luxury brands. The Holt Renfrew Ogilvy ground floor will be anchored by several significant luxury brand boutiques, including Chanel and Louis Vuitton. Chanel will relocate from Holt Renfrew’s current store at 1300 Sherbrooke Street West, and Louis Vuitton has been an existing tenant inside of Ogilvy for more than two decades. Other ground floor luxury concession boutiques will include Christian Dior (in a 2,000 square foot boutique), Fendi (700 square feet), Hermès (3,000 square feet, or about three times the size of its current Holt’s space), Prada (2,300 square feet) and jeweller Tiffany & Co., spanning about 2,500 square feet. Interestingly, Tiffany & Co. also currently operates a boutique at the base of the Ritz Carlton Hotel across the street from Holt Renfrew on Sherbrooke Street West -- in a space that is only about 2,000 square feet, which means that the Ogilvy shop-in-store will be larger than Tiffany’s existing freestanding unit. In total, about 20,000 square feet of Holt Renfrew Ogilvy’s ground floor will be devoted to luxury handbags and small leather goods. While impressive in size, it might be noted that the Vancouver Holt’s flagship’s accessory department spans in excess of 30,000 square feet — sales at Vancouver’s Holt’s are considerably higher than in Holt’s Montreal store, buoyed by Asian shoppers who are spending a fortune on luxury brands on Canada's West Coast. Holt Renfrew Ogilvy’s women’s footwear salon will span about 8,000 square feet, which is about the same size as its recently unveiled Vancouver footwear hall. The Vancouver space includes an 500 square foot Ladurée café. The expanded Montreal Holt Renfrew Ogilvy will be Holt Renfrew’s largest store, by far. The Vancouver flagship at CF Pacific Centre in Vancouver, which is one of the most productive department stores on the continent, has almost 188,000 square feet of space over four levels. The Toronto 50 Bloor Street West flagship is a bit smaller, with about 182,400 square feet over four levels, as well as a double-mezzanine with a restaurant, shoes/apparel, salon and storage — the store recently lost about 3,800 square feet of ground level space when it vacated part of adjacent 60 Bloor Street West. Holt’s also operates a 16,500 square foot standalone men’s store at 100 Bloor Street West which, remarkably, contains the entire men’s offerings for Holt Renfrew in the downtown core -- contrasting with Harry Rosen’s more than 50,000 square feet of space directly across the street. Montreal’s Holt Renfrew Ogilvy will have some competition when it opens. Last year, Saks Fifth Avenue announced that it would open a 200,000 square foot flagship at the back end of Hudson’s Bay’s 650,000 square foot store on Sainte Catherine Street West, though sources in the company are no longer providing a definitive timeline as to its anticipated opening date, which was supposed to be several months from now. La Maison Simons, which carries some luxury brands in its downtown Montreal store, is set to see a renovation over the next couple of years. And menswear retailer Harry Rosen, which is still the undisputed king of luxury menswear in Canada, operates a recently renovated flagship store at downtown Montreal’s Les Cours Mont Royal. There are also several independent multi-brand retailers that carry luxury brands — though sources say that luxury sales are considerably less in Montreal than they are in cities such as Toronto and Vancouver, making one question if the market will become oversaturated with the expanded Holt Renfrew Ogilvy, as well as the possibility of Saks Fifth Avenue moving downtown in a big way. The Montreal Holt Renfrew Ogilvy project will cost in excess of $100 million when all is said and done, with developer Carbonleo being involved with the development. The store is being designed by interior designer Jeffrey Hutchison & Associates, with support from Montreal-based Lemay. Interiors will be “bright and modern, with a palette that layers luxurious textures of stone, glass, metal and fabric,” that “will create an opulent shopping environment”. The 'Four Seasons Hotel and Private Residences’ expansion facade is being designed by Gensler, which will maintain heritage elements as well as refurbish the historic fifth-floor Tudor Hall music/meeting space inside of Ogilvy. Mario Grauso, President of Holt Renfrew, said: "This is a dynamic city with a rich history, and a renowned fashion legacy that we are honoured to be a part of. Inspired by the best of both Holt Renfrew and Ogilvy, we have designed this store to offer our customers the very best luxury products and an unparalleled shopping experience in what promises to be one of the most beautiful stores in the world."